“Fail fast.” “Fail often.” “Reward failure.” It’s easy to evangelize a fast-fail philosophy in spirit, but it may be especially difficult in the classroom—after all, an F in college is not exactly a badge of honor. Add to this millennials’ oft-cited propensity for perfection, desire to please and conform, and you don’t exactly have a recipe for high-risk innovation. Although some studies have painted a portrait of this generation as risk averse, and evidence suggests Gen Z may be even more risk-averse and practical-minded than their predecessors, many young entrepreneurs are pushing back at that assessment. Meet Jillian Clemente, a member of the Young Innovators program at West Virginia University pursuing a dual major in Journalism and Wildlife and Fisheries Resource Management. She is also a two-time veteran of the Media College’s Innovators-in-Residence Experimental Storytelling program, where she worked closely with John Keefe and inventors at MIT Public Lab in her environmental sensor work, helping to pioneer new projects and classes in the College’s “Maker Lab.” She is also a member of Launch Lab, which is the University’s business incubator for student entrepreneurs. As a young entrepreneur juggling multiple passions, she shares firsthand what it’s like to jump into the deep end and offers some advice to fellow students. As a sophomore Jillian Clemente took the lead in her sensor journalism project. 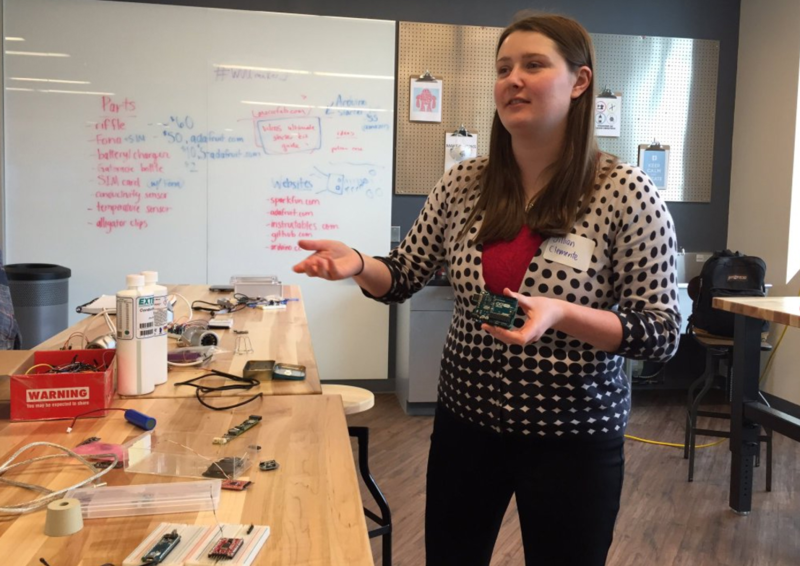 Now she leads workshops for community media and citizen scientists in how to build and use water sensors and other DIY electronics. Photo by David Smith. What’s your advice for fellow students on cultivating resiliency and taking risks in their entrepreneurship journey? I’ve needed teachers and leaders to help me up quite a bit, and I’ve learned that it’s okay to ask for help, whether you’re starting from scratch, or starting over again. It can be scary to do something new from scratch and maybe come out with no tangible new “thing,” but I can promise you the process is worth it. Acknowledge the fear. Now throw it away. Fear is dumb. Innovate because you want to, not for anything else. Don’t do it to impress people and don’t take more than you can handle. If you’re doing the work for the right reasons, you’ll be pleased with the process and the project as a whole. There’s never a reason to worry that “nothing will come out of it.” Something positive always comes out of it. You are going to fail, but you’re not a failure. First, know your worth as a person—you yourself are a unique innovation. Now give it your all. The end result may not be a “success” as in “hey, this thing works,” but it will be successful in giving you problem-solving skills and insight into your resilience as a human being. Try listing out your new skills after a project or experiment (regardless of its “success” or “failure”) for your resume, and you’ll be pleasantly shocked. Accomplishments can be tiny—hey, look, you MADE something! Remember when you gave your parents a drawing and they got so excited about how amazing it was, even if it wasn’t perfect? Get that way about your own accomplishments, no matter how small. It’s an achievement to make one component of a final piece. Yes, there are always more miles to travel, but you did something. You made it to a goal and, in a field of so many unknowns (um, innovation), it’s the showing up, the tiny steps, the trial and error that makes way for expertise and breakthroughs. Don’t shut people out—listen to all. Pride is an idea killer. Plus, if an idea doesn’t work, you’ll still have some backups to test out, too. Also, acknowledge the introverts and extroverts. Some people may need longer breaks alone to perform best. You’re choosing to spend your time doing these things. Choose joy. Enjoy the process. Enjoy the failures. Enjoy collaboration and the betterment of yourself and, possibly, the world. Dana Coester is an associate professor at West Virginia University Reed College of Media, where she is creative director for the College’s Media Innovation Center and leads the Center’s Knight-funded Innovators-in-Residence program. She is also the creative director and executive editor for the digital media startup 100 Days in Appalachia. Reach her on Twitter at @poetabook. Next: What’s an Intrapreneur? And How Do I Become One? Media Innovation and Entrepreneurship by Dana Coester is licensed under a Creative Commons Attribution 4.0 International License, except where otherwise noted.